Some supplements can help weight trainers build muscle, increase athletic endurance and speed injury recovery, but most are ineffective and dangerous. There are a number of popular vitamins and supplements that weight trainers, athletes, and others who engage in intense exercise take in the hopes of increasing muscle mass, losing weight, preventing injury or facilitating rapid recovery. Research indicates that some of these vitamins and supplements are useful, whereas others provide no benefits and may cause serious health problems. Amino acids may promote additional muscle growth in some individuals if the timing of ingestion is right (30 minutes before weight training or directly after), but the effects are minimal. Also, contrary to popular belief, amino acids do not aid in recovery or enhance performance. The equivalent of approximately 2 cups of coffee or 4-6 cups of tea two hours before strenuous exercise can enhance endurance. However, these benefits do not occur when exercising in high heat and those with certain medical conditions such as heart disease should not use caffeine for endurance enhancement. Also, caffeine can cause dehydration, so if you do drink coffee or tea before exercising, make sure you also consume plenty of water over the course of your workout. Despite its popularity as a muscle enhancer and weight loss aid, this supplement shows no efficacy for increasing muscle mass or reducing fat, and large doses may damage DNA. Combined with high-intensity exercise, this popular supplement can increase strength, power, and muscle mass. However, studies of its effects on performance have generated mixed results, with some actually finding that Creatine can diminish performance. Short-term side effects include muscle cramping, dehydration, and diarrhea. Long-term effects are unknown. Dehydroepiandrosterone (DHEA) has been shown to increase strength and muscle mass in older individuals, but provides no beneficial effects for younger people. Side effects include testicular shrinkage and breast growth in men and masculinization in women, and taking DHEA may increase the risk of prostate, breast, and ovarian cancer, according to the Mayo Clinic. Stimulants increase energy levels and decrease appetite. However, they also cause nervousness, irritability, insomnia, paranoia, heart arrhythmias, and even hallucinations. The only stimulant that is relatively safe is a low dose of caffeine. However, those with certain conditions such as heart disease and anxiety disorders should avoid all stimulants, including caffeine. Although ginseng enhances performance in animals, human research conducted thus far suggests that it does not improve performance in people, and high doses can cause insomnia, nervousness, and high blood pressure. Research indicates that Growth Hormone does not increase muscle growth or enhance performance in humans. Additionally, it has been implicated in a number of serious health problems, ranging from diabetes to enlarged heart to carpal tunnel syndrome. Beta-hydroxy-beta-methylbutyrate (HMB) increases muscle strength and size while decreasing body fat. Side effects have not been reported, but long-term effects of this supplement have not been studied. Steroids increase muscle strength and muscle mass, but also aggression. Additionally, they can cause a number of short-term health problems such as testicular shrinkage, breast growth, and acne, as well as long-term problems such as liver, heart, and prostate disease. Steroids can also depress the immune system, cause masculinization in women and children, and reduce sperm counts and testosterone production in men. Research indicates that vitamin C is the only vitamin supplement that improves athletic performance, as well as boosting immune function. Research also indicates that vitamin E may protect muscles during weight training and sports activities, and that both C and E speed recovery after injury in some cases. Vitamins C and E are powerful antioxidants that protect against destructive free radicals, which can cause cancer, as well as various degenerative diseases. However, recent research indicates that long-term ingestion of large doses (400 IU) of vitamin E is actually associated with higher rates of cancer and heart failure in certain populations, so sticking to a normal dose (40 IU or less) is recommended. Many people (particularly women) are deficient in iron, which can cause feelings of exhaustion and weakness. Iron can be obtained naturally by eating meat, fish, poultry, lentils, beans, fortified breads, and cereals, though there are also supplements available. Vitamin C aids in iron absorption, so taking it with iron-rich meals (i.e., having a glass of orange juice with your dinner) can help to prevent iron deficiency. Water is the most important substance for an athlete, as dehydration can cause muscle fatigue and cramps. Plain water is usually sufficient, though people who engage in extreme exercise or work out in hot climates should also replace lost electrolytes, which can be obtained in certain sports drinks. For more strength training articles, see the main Strength Training page. For a full list of health and wellness articles, visit the main Mind/Body Health page. This article is provided for informational purposes only; it is not intended as a substitute for medical consultation. Always consult a doctor before taking supplements. American Academy of Family Physicians. (2008). 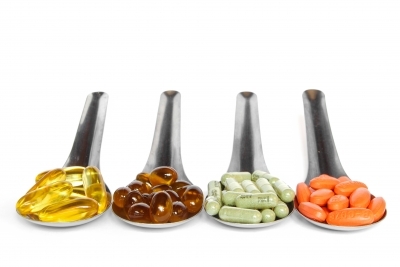 “Vitamins and Minerals: What You Should Know.” U.S. National Library of Medicine. Evans, W.J. (2000). “Vitamin E, vitamin C, and exercise.” American Journal of Clinical Nutrition, Vol. 72, No. 2. McFarland, E.G., MD. (Updated 4 October 2002). “Johns Hopkins Focus: Sports Enhancers – The Good, the Questionable and the Dangerous.” The Johns Hopkins University. Ransford, M. (1 November 2000). “Research Finds Vitamin E Protects Muscles During Weight Training.” Ball State University.